Chances are you have opened up various cloud accounts and services over the course of your online life and know that it can be quite a chore to manage or look for documents on your PC or mobile phone. 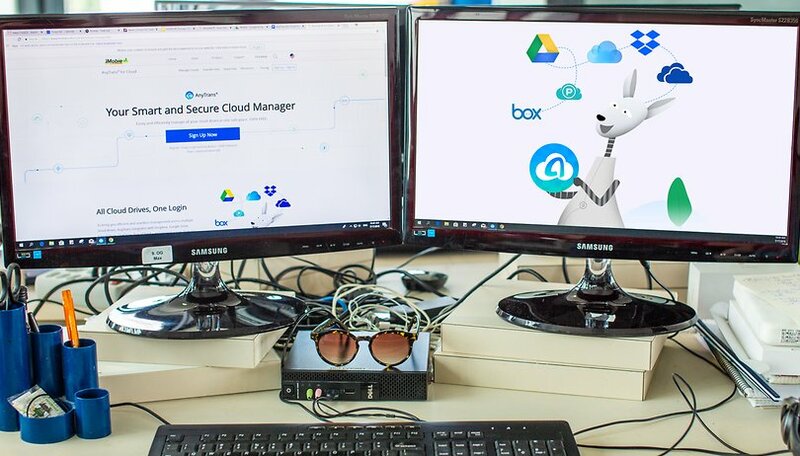 There is a cross-platform and multi-account solution called AnyTrans from iMobie that makes life a lot easier when it comes to finding, moving, sharing, downloading and uploading files to your various cloud services. Thanks to the all-in-one overview of your cloud storages, the service provided by AnyTrans is indispensable for both professional and private life online. What’s even better, the app is free. Get AnyTrans for PC /Mac now! Or have a quick start with AnyTrans web-based app. Not only is it free, you can sync an unlimited amount of content, and everything is completely safe. AnyTrans has put some significant measures into place to ensure this: it has adopted Google and Apple 2FA verification as well as encryption technology, and it uses an authorization system allowing you to grant or cancel permissions at any time. In this day and age, companies need to take security and online privacy seriously, and it’s great that AnyTrans has done this. AnyTrans is easy to set up from the get-go and allows you to add your existing Cloud storage accounts with ease. There’s no longer the need to install multiple cloud apps on your PC or open everything up in separate browsers. The available cloud services are Box, Dropbox, Google Drive, OneDrive, pCloud and iCloud Drive. After you have added your cloud services, you will see them listed on the left-hand side of the overview. Below this you will see a plus sign that allows you to add a new cloud service any time. Further down on this same side, you can view shared, starred and recently viewed files. An additional menu is hidden under the cloud icon at the top left side. By clicking on this, you will be given the options to access an online guide to the app, change the language (French, English, German, Spanish, Japanese and Arabic), check for updates etc. You can also check out the web-based version of AnyTrans for Cloud. AnyTrans allows you to search through all the clouds for your file and transfer data directly from one cloud storage to another easily. Other features include being able to upload or download files or folders between your PC and the AnyTrans app. This is shown in an overview entitled Uploading, Downloading and Finished. When trying this out, it happened so fast that I hardly had time to see it in either the upload or download sections, but could see that it has been done in the finished overview. The fact that it is so speedy is great. There’s also the option of downloading or uploading files in bulk from multiple clouds simultaneously after having made multiple selections. Another cool function is that AnyTrans supports scheduled and offline transfers. This is helpful when for planning in advance or when you are on the go without an internet connection. When it come to sharing with others, you can do this various ways: select the documents or files and select a link of the way it should be shared, which could be Twitter, Facebook or Google+. You can also send a link that contains the download option for the file that you can paste in a message to someone. For this option, you can set an expiration date. Shares can be cancelled at any time and you can also see how many times the files have been downloaded. Finally, you can simply input your contact’s email address and the link will be sent to them directly. Do you use both Apple and Android devices? AnyTrans has created a great guide on how to transfer data from iCloud Drive to Google Drive. AnyTrans is truly a great app that brings all cloud services to one manageable place where moving files any which way is made easy and is very fast. Its safe, secure and cross-platform nature make AnyTrans a must-have for those who want to be in control of the cloud world in both their professional and private life. Have you tried iMobie AnyTrans yet? Let us know what you think in the comments below.